Currently browsing posts filed under "Cappy Hill ’76"
“Low-Income Students and Highly Selective Private Colleges: Searching and Recruiting” (pdf) by Cappy Hill ’76 and Gordon Winston is an interesting read. Perhaps. But the real problem lies in their initial assumption. So it has been our assumption that these privileged schools should aim to have their student bodies include students from low-income families at least in proportion to their share in the national population of high ability students. Professors Gordon Winston and Cappy Hill ’76 provide their usual excellent research in “Low-Income Students and Highly Selective Private Colleges: Searching and Recruiting” (pdf). But, for now, leave aside the substance and consider the opening sentence. Low-income students’ access to the best of American higher education is a matter not only of individual equality of opportunity, but of social efficiency, of fully utilizing the nation’s talents. Really? By default, we all assume that it is a good thing that Williams, and other elite institutions, scour the earth for the best and brightest. The smartest kid in Nowhere, Kansas should go to Williams, not to Kansas State. But is this really a good thing? Is it best for society if the most talented individuals are whisked away from their local communities at age 18, fated to, in all likelihood, never return? Sometimes, I am not so sure. Consider some opposing arguments. Indeed, with regard to higher education, we might think of meritocracy as the equivalent of the practice of strip-mining. For the meritocratic system is a method that uses impersonal technology (e.g., the SAT) to help us identify valuable natural resources (bright kids), and then pitilessly removes them from their ecological contexts (local communities), never to return them, thus creating cultural landscapes just as ravaged as the denuded mountainsides of Kentucky coal country. Indeed. 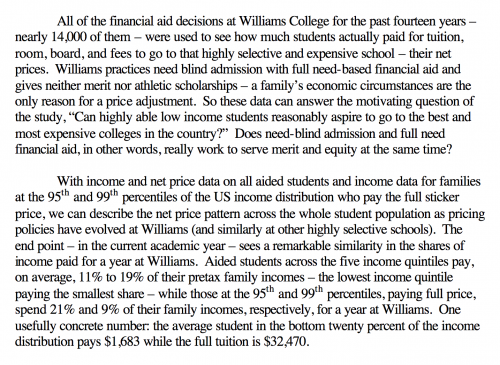 Obviously, I would not expect Williams to change its current admissions practices because of these concerns. I want us to find the most academically talented and ambitious 18 year-olds in the world and bring them to Williams. If that hurts the small towns they come from, too bad. But the more firmly you hold belief X, the more you should seek out the smartest arguments against it. Cappy Hill ’76 is expected to be named the next president of the college within the next two months, definitely before the end of the academic year, according to a person familiar with the matter, who refused to be identified because the hope is to keep the appointment under wraps for the time being. We, of course, predicted this three weeks ago. The New York Times reports on the financial crunch hitting higher education. Tough economic times have come to public and private universities alike, and rich or poor, they are figuring out how to respond. Many are announcing hiring freezes, postponing construction projects or putting off planned capital campaigns. With endowment values and charitable gifts likely to decline, the process of setting next year’s tuition low enough to keep students coming, but high enough to support operations, is trickier than ever. Dozens of college presidents, especially at wealthy institutions, have sent letters and e-mail to students and their families describing their financial situation and belt-tightening plans. At Williams College, for example, President Morton Owen Schapiro wrote that with last year’s negative return on the endowment and the worsening situation since June, some renovation and facilities spending would be reduced and nonessential openings left unfilled. Vassar College will give out $1 million more in financial aid this year than originally budgeted, even though the endowment, which provides a third of its operating budget, dropped to $765 million at the end of September, down $80 million from late June. President Catharine Bond Hill of Vassar said the college would reduce its operating costs, but remain need-blind. I never knew that Cappy Hill’s ’76 middle name was Bond. Is there some union rule that requires the presidents of elite liberal arts colleges (Morton Owen Schapiro, Catharine Bond Hill) to have three names, sort of like presidential assassins? 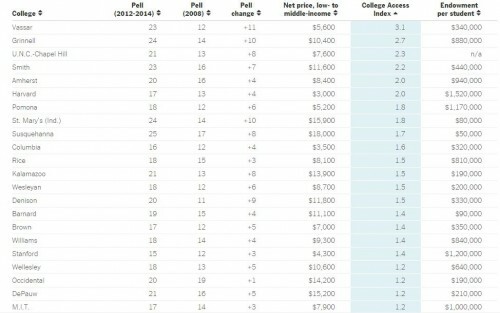 EphBlogs favorite Lord Jeff (after Tony Marx), Mondale Hall, points to a statement about college rankings, which has now appeared on the College’s website. Correct! Information and transparency are good things. Previous commentary here. OK. No single formula is best. The more (accurate!) information that colleges provide, the better. But complaining about a “frenzy” is mostly stupid. You might as well complain about the sky being blue. Outside of radical changes, there will always be a frenzy. Excellent! This is great news, both objectively and for EphBlog readers. Imagine all the fun that we can have with this data . . . With luck, other colleges will follow suit. Kudos to these presidents! This is exactly the right answer to the idiocy of the Lloyd Thackers of the world. But will they really welcome (and act on?) suggestions? I hope so. For a start, a key issue will be the level of disaggregation in the data. The more detail, the better. For example, we want to know the size of every class that a college offers, not just summary measures like the percent of classes with more than 50 or fewer than 20 students, as US News reports. We want to know the entire (joint) distribution of SAT scores, not just the 25th and 75th percentiles. We want to know how many students come from which high schools. There are lots of messy details to figure out in how to organize and standardize this data. Let’s start. This seems sort of stupid. Why pick on US News? 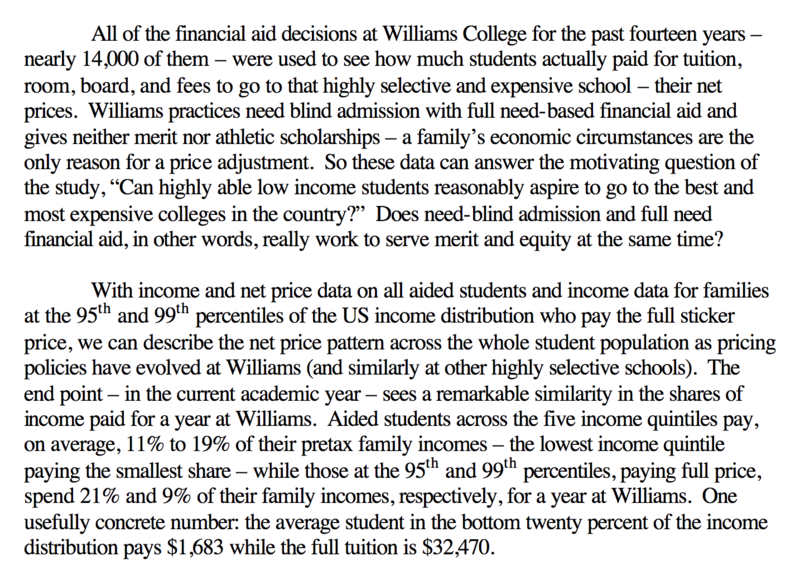 It also seems to hurt Williams much more than other schools, especially when we are competing for students from different (i.e., poor, non-US) backgrounds. Any Ephs in this list besides Cappy Hill ’75? Which colleges are most notable by their absence? 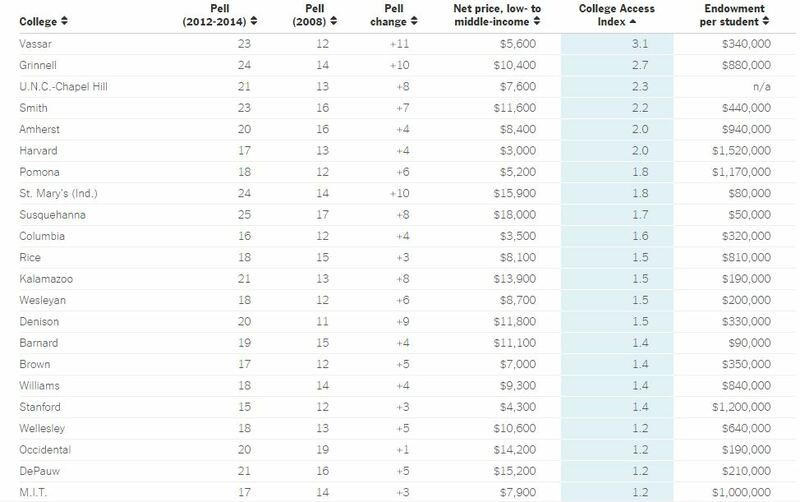 Davidson (#9) and Claremont McKenna (#11) seem to be the highest ranked colleges not on this list. Did they decline to sign or were they not even invited. Also, whose idea was a joint letter? Who did the first draft? Details, please. Hall writes, “I think this effectively ends Lloyd Thacker’s fifteen minutes.” I hope so! Also, just think of all the fun that we are going to have asking for data that the colleges ought to publish but won’t want to. Morty and his friends want to make graduation rate data available? Great! Tell me graduation rate data by race or family income. Do poor students graduate at the same rate from Amherst as rich students? If not, isn’t Tony Marx failing them? Just asking! 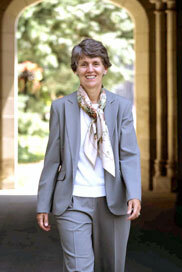 Vassar, led by former Williams provost Cappy Hill ’75, is going need-blind on admissions. Ten years ago, Vassar College began factoring financial need into some admissions decisions, a move necessitated by ballooning aid costs that similarly affected the policies at other institutions. Last week, reflecting a growing concern over the accessibility of higher education as well as more favorable economic conditions, Vassar announced that it would buck the trend and return to completely need-blind admissions for first-year freshmen. “We were really seeing it — along with other schools — as a way of getting the message out that these kinds of schools are affordable for families given our financial aid policies, and your financial need won’t hurt you in the admissions process, and that’s the message we wanted to get out,” said Catharine B. Hill, who became the president a year ago after serving as the provost of Williams College, one of the relatively few liberal arts colleges — now including Vassar — that have both need-blind admissions and pledges to meet full need. Yeah, yeah. I see this as more public relations/make the faculty and other stakeholders happy. [Former Williams professor] Michael S. McPherson, president of the Spencer Foundation and an expert on financial aid issues, taught Hill when he was an economics professor at Williams and she was an undergraduate. He said that the trend for most colleges has been in the opposite direction — away from need-blind admissions — similar to Vassar’s move 10 years ago. The exception is among top-tier institutions, which have been taking various measures to make themselves more accessible to students from lower-income backgrounds. EphBlog is powered by WordPress and delivered to you in 1.084 seconds using 42 queries..